HOW MUCH FASTER IS THE NEW VRAY 3 BETA FASTER THAN PREVIOUS VERSIONS SUCH AS VRAY 2.4? When I first installed the new Vray 3 Beta apart from the new features the first thing I wanted to take a look at was the speed, how much faster is it? I thought I would share some quick tests ive done with the new Vray 3 Beta, The below tests were done with Vray 3.05.01 & Vray 2.40.04. The Chaos Group has changed the method of pricing and with Vray 3 you will have to for extra render nodes full info can be found here. Instalation of the vray 3 beta was very quick & simple as always & it is easy to switch & re-install previous versions, as far as I know you cannot have both versions installed at the same time but it only takes 5 minutes to re-install/swap from an older to new version. My first tests were very basic & I just wanted to review & test the speed of Vray 2.40.04 Vs Vray 3.05.01. I wanted to test the Chaos statement “Early comparisons show speed increases from 1.5 to 5 times faster.” listed at http://www.v-ray.com/features/faster-ray-tracing/ was about right. All of these tests are only quick tests using CPU rendering, the scenes have not been optimized and use a basic material scene from http://www.vray-materials.de/ which is a great source for vray materials. This is just a quick & simple test & my mathematics is not a strong point so if you spot any discrepancies let me know! 0:21:12.7 Seconds - 161.82% Faster. 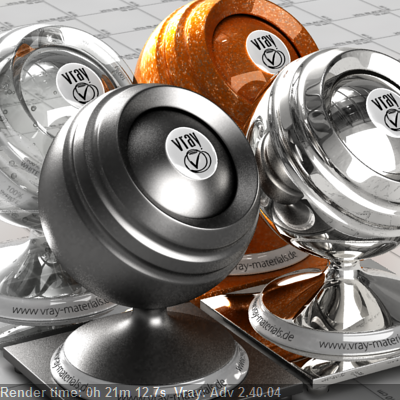 Answer: Chaos Groups Vray 3 vs 2.4 is that Vray 3.0 Beta is a LOT faster at raytracing than previous versions!